Arrestins are structurally flexible and functionally versatile proteins that regulate the activity of hundreds of different G protein-coupled receptors (GPCRs). A hallmark of arrestin function is that these proteins are only activated for binding the active receptor upon interaction with receptor-attached phosphate groups. 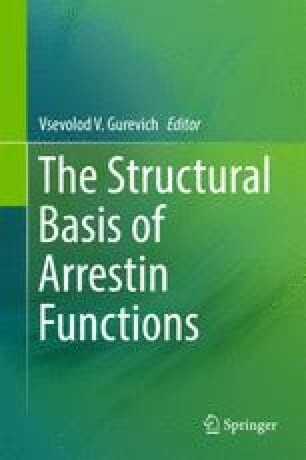 Recent years have yielded crystal structures of pre-activated arrestins and arrestin in complex with an active receptor, which provide insight into the arrestin activation mechanism. At the same time, functional studies indicate that arrestin employs different binding modes along the path to tight receptor binding, and the structure of the arrestin-receptor complex is modulated by the activation and phosphorylation state of the active receptor. In this chapter we discuss our current understanding of the receptor-binding mechanism of arrestin, from the initial interaction with the phosphorylated receptor to the structural transformation required for tight binding to the active receptor.